Great teaching aid for typing/keyboarding classes. Complete opacity ensures accurate skill evaluation. 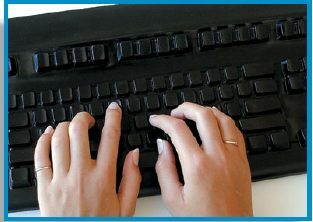 Very Flexible - won't affect typing accuracy. Custom molded for perfect fit. Slips on and off in seconds, yet remains securely in place while typing. Durable polyurethane mask can easily cleaned. School POs accepted and volume discounts available. DataCal's typing mask is a black cover that molds to your specific keyboard model. 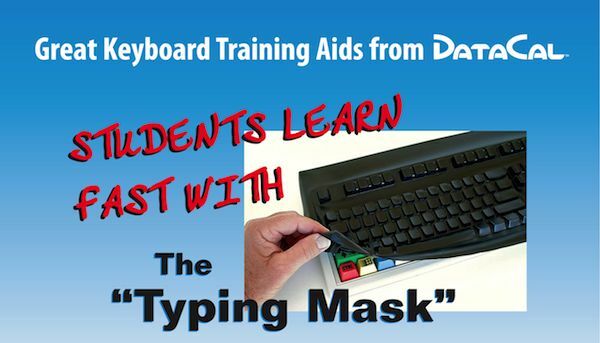 Perfect for keyboard training, the mask covers the keys, but stays in place for accurate touch typing. Popular in schools and computer labs. Easy to remove and clean. Quantity discounts available. DataCal Enterprises offers thousands of typing mask models, so please call 800-223-0123 or "Request Information" above.